Henrik Lundqvist will travel with the team to Ottawa and serve as backup to Cam Talbot. He will start at least one of the games this weekend. Photo courtesy of MSG Photos. The Rangers are now one step closer to getting their franchise goalie back on the ice, as he will be traveling with the team for the first time since his injury when they head to Ottawa to take on the red hot senators. Lundqvist has been on the ice for a full practice and for a morning skate, taking both high and low shots, but still needs another practice or morning skate and a bit more time to prepare mentally for his return. Tomorrow night, Lundqvist will serve as backup to Cam Talbot on Thursday, with the goal of starting at least one of the games this weekend. Lundqvist has missed the last 24 games with a vascular injury from taking a puck to the neck during the game on January 31st against the Carolina Hurricanes. To make room for Henrik Lundqvist on the roster, the Rangers sent Mackenzie Skapski to the Hartford Wolf Pack, New York’s AHL affiliate, and removed Lundqvist from the LTIR. Skapski and Yann Danis will be Hartford’s two goaltenders, and Skapski will definitely get a good amount of games. With the Rangers, Skapski was 2-0-0, allowing just one goal in two games against the Buffalo Sabres, recording a shutout as well as a shutout streak of 159:46. After Thursday’s game, Lundqvist will re-assume his role as starting goaltender for New York, something head coach Alain Vigneault made very clear. While the Rangers will not have a morning skate on Thursday, but Lundqvist will travel to the arena to take shots and do drills. Vigneault added on to that by saying hopefully some of the shots would come “from Marty,” referring to the injured Martin St. Louis, who will also be traveling with the team to Ottawa and Boston. 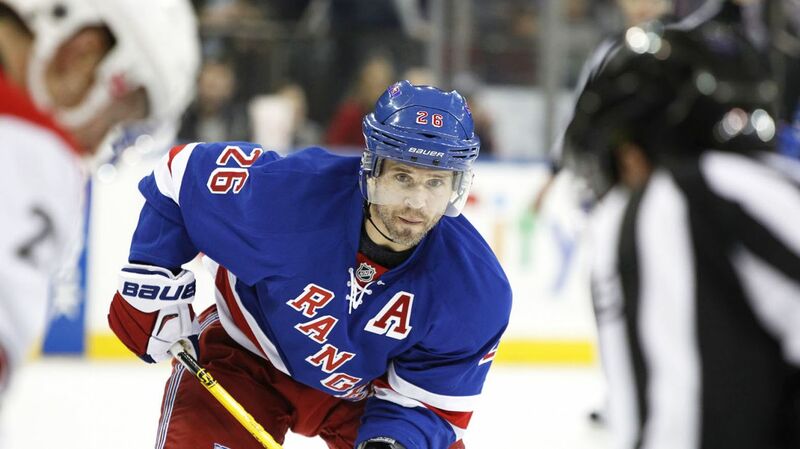 Martin St. Louis will travel to Ottawa for tomorrow’s game. He won’t play, but hopefully will start taking some shots and participating in drills as soon as tomorrow. Photo courtesy of MSG Photos. 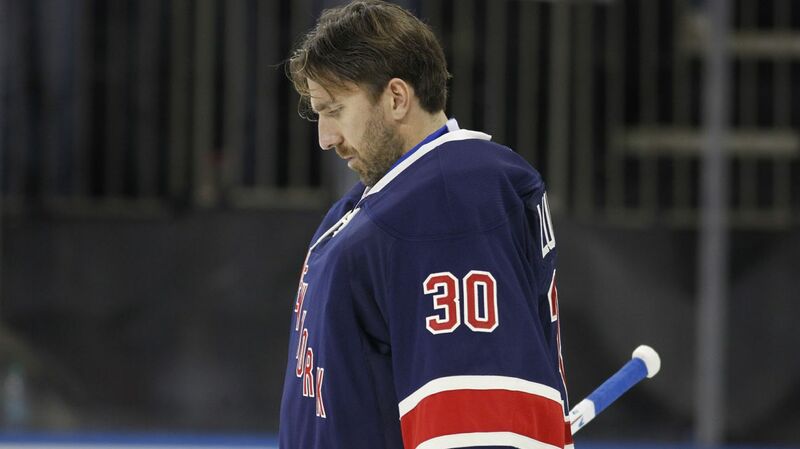 “I can feel every day is a step in the right direction,” Lundqvist said. “I feel more and more comfortable. I’m reading the guys better, a lot of it is regaining my patience. You want to try and stop the puck so badly that sometimes you tend to make the first move, so right now I’m working on being more patient. I’ve been skating for 4-5 weeks, at least, so it’s about being more comfortable facing shots and the speed. Physically I feel the same every day. This is a great sign for Rangers fans and a huge boost to the lineup. Talbot has been very good, but like Vigneault said, Lundqvist is the guy, clearly evident by his success and playoff performances. After Thursday, there will be nine games left in the regular season. Posted on March 25, 2015, in Rangers Updates and tagged Alain Vigneault, Cam Talbot, Henrik Lundqvist, King Henrik, Lundqvist, Mackenzie Skapski, Madison Square Garden, Martin St. Louis, MSG, MSL, New York Rangers, NHL, NHL 2014-2015 Season, NY Rangers, NYR, Rangers, Rangers Nation, Rangerstown, Talbot, The Ranger Zone. Bookmark the permalink. Leave a comment.